Start your new year off right by resolving to make your OWN wine and cheese this year! Curds and Wine has everything you need to get started right away. Join us at our Winemaking Demonstration to see how easy it is to make your own award-winning wine any time of year, and start your own wine to enter in the Winemaker Magazine Homemade Wine contest in March and the San Diego County Fair Homemade Wine contest in May. Then pick up a cheesemaking kit or sign up for our upcoming Cheesemaking Fundamentals class to learn to make your own cheese at home. You'll be set for the rest of the year with lovely homemade wines and cheeses for upcoming summer cookouts and holiday gifts! We will be hosting the first San Diego Kit Winemakers' Club at the end of the month. Even if you haven't made any wines yet, this club will be a great group to talk to other winemakers and get inspired to make your own wines! See more information below. Join us for our FREE winemaking demonstration where we'll show you just how easy it is to make your own wine, at home or on site at Curds and Wine! We will go through all of the basic steps of making wine from kits, from start to bottle. This will be an interactive demonstration, you will have an opportunity to take part in winemaking steps hands-on. This demonstration will take about 2 hours, and then you can start your own wine! 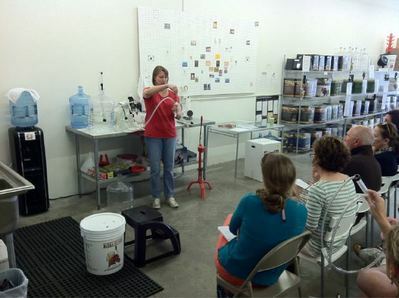 There is no charge, and you will get 10% off of any wine kits you purchase following the demonstration. Discover how easy and rewarding it is to make your very own wines! It's a New Year, and we are already preparing for Harvest 2012 at Curds and Wine! We will be offering two sets of Winemaking from Fresh Grapes Courses this year, the Basic Winemaking from Fresh Grapes 3-seminar series as well as the Grapes-to-Glass Hands-on Winemaking Course. Seminars will begin in June and continue through August, with Hands-on classes extending through October. Space in these courses are very limited and are going quick, so reserve your spot today! Join us at Curds and Wine to learn how easy and rewarding it is to make your own cheeses at home! At this class you will learn the fundamental processes behind fresh cheesemaking as well as the techniques for making pressed cheeses and aged cheeses such as cheddar, gouda, and camembert. We will make fromage blanc, ricotta, and queso fresco, and demonstrate the processes involved in making feta, swiss-style cheeses and mold-ripened cheeses such as camembert/brie-style and blue cheeses. We will have samples of the various styles of cheeses you can make at home from Venissimo, as well as other refreshments. Finally, you will receive a packet with a recipe booklet to make the cheeses from the class as well as basic supplies to get you started with your cheesemaking. You will also receive a 10% discount on any purchase in the shop following the class. The fee for this class is $65 per person, and class size is limited to 12 participants. Three amazing Limited Edition wine kits will be released this month! Winexpert will have a Washington Meritage [SOLD OUT] and a South African Sauvignon Blanc/Semillon [SOLD OUT] available, and Cellar Craft will release their Bella Sonoma Vineyard Pinot Noir. We will email you when these kits arrive if you pre-ordered them already. If you did not and are interested in any of these special wine kits, please contact us, we do have a few extra ordered. Please note, these kits are for in-store pick-up only! Join the new San Diego Kit Winemakers Club! We will focus on making wine from kits and concentrates, and will discuss tips, tricks, and tweaks. You must be 21 or over to join and participate in club activities.We will discuss how we would like to structure the club and plan future meetings. The meeting will be held on Sunday January 29th, 5:30 pm at Curds and Wine. Members are invited to bring food and wine to share at the initial meeting. Please RSVP for this event here. Start Planning to Enter Winemaking Competitions This Year! There are several Homemade Wine Contests coming up in the next few months, time to start planning YOUR entries! Winemaker Magazine has the world's largest wine competition, entries need to be shipped to their headquarters in Vermont by March 16, 2012. Entry forms and more information can be found online. When shipping wine for competitions, package them well, in a wine shipping container if possible, and always send samples by FedEx or UPS, never USPS. If you win a medal in the Winemaker Magazine competition with a wine kit from Winexpert, they will give you a FREE wine kit equal to the one you won with! 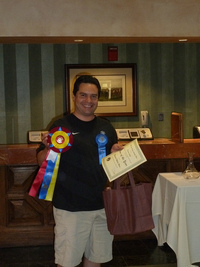 Other upcoming competitions include the San Diego County Fair, where one of our customers won Best of Show with his first-ever wine kit in 2011! We will have lists of upcoming competitions and entry information in future newsletters. 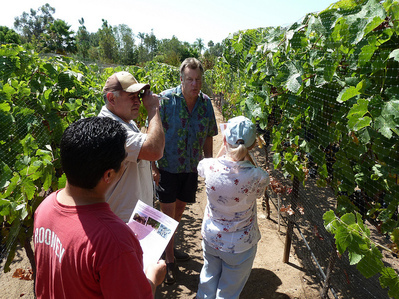 Many people seem to think that Temecula is San Diego's "local" wine region. But we have many outstanding wineries and wine grape growers in San Diego county. Ramona Valley was declared an official wine AVA (American Viticultural Area, which designates distinctive wine grape regions in the United States) in 2006. To learn more about our real local wine region, read their new online publication, Ramona Valley Wine Region. Check out the winery map inside, and head over to the tasting rooms to taste some of the best wines you've ever had! Our friends at Ramona Ranch will be hosting a presentation by Bob Hayes of Prevailing Wind Power on Saturday, January 21st at 3 pm. Please RSVP here if you are interested in attending this free seminar.